Why vintage Volvos weren't considered performance cars in the '60s. 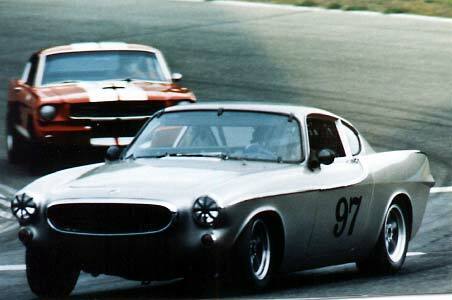 Vintage Volvos in racing in the '60s and vintage racing today. Street performance modifications including engine swaps and supercharging. By the end of the series we will have reviewed the various levels of performance modifications available for the street and race track, and will cover the progress of my project to create what will hopefully be the "ultimate street performance vintage Volvo" by applying current suspension, supercharger and ignition technology. Throughout all of it we will focus on how to get "the most bang for your performance buck" without changing the basic vintage character of the car. Input from fellow enthusiasts during the course of the series will be appreciated. Let us know what you have been able to achieve and how you did it so we can share the information. Since I used to climb over the fence at Bridgehampton in the early '60s to watch Art Riley and others notch up impressive finishes in their 544s and 1800s, I have been an enthusiastic fan of Volvo performance and racing efforts, and hoped to eventually race one myself. Although I had owned other Volvos for basic transportation, it was not until the '80s that I finally owned my own 1800. As is apparently my nature, a street car restoration project quickly got out of hand and turned into a vintage race car. After 20 years of racing other things, including Saabs and Husqvarnas, I was finally racing a Volvo. The performance potential with the right modifications was readily apparent. After a couple of years, my 1800 became dominant in its vintage racing classes and a competitor for overall race wins against Jags, Corvettes, Porches, Loti, Aston Martins and other cars it was not supposed to have a chance against. It quickly became apparent from racing successes that with the right modifications vintage Volvos could be impressive on the street as well. In the early '90s we began offering a small number of performance parts for street use based on our racing developments, thus the name of the company: Vintage Performance Developments. While we felt the 1800 was close to its performance potential on the race track and the racecar would in fact make a great street car, Volvo owners interested in street performance were often disappointed with what they could achieve on the street without unacceptable compromises and/or cost. At some point the idea hit to build a street 1800 that would both be a comfortable daily driver and would have performance similar to my racecar. This would require at least 180 HP with a broad power band and handling to match. This idea has now evolved into an a car with a modern, high tech supercharger. The development and testing of this car will be described in a future article on what will hopefully become the "ultimate vintage Volvo." Besides building one for myself, our plans are to offer supercharger kits for vintage Volvos, assuming successful reliability and performance tests on the prototype, and the expression of sufficient interest. A 1959 review of the 122S described its ability to take corners "with considerable body roll and squealing of tires." (Road and Track, September 1959) In a later road test of the 122S (June '61), Road and Track referred to "the top heavy feeling of the machine." There were high hopes for the P1800, but in its first road test of the car in February '62 Road and Track stated, "There was a dreadful amount of body lean while cornering... " A 1965 Road and Track review of the 1800S praised the engine as "a most impressive unit," but stated "the acceleration of the 1800S is still on the leisurely side," with a 0-60 time of 13.9 seconds. Several years later, the 1800ES received suspension upgrades which included rear disc brakes, wider wheels and 70-series tires, but criticism of the handling continued. Road and Track said in its March 1972 review, "The ES...has good suspension travel for large bumps and dips. In fact the car is a little on the soft side and there's a lot of body roll in hard cornering...handles well in ordinary driving...but gets tippy and squishy at the limit." They concluded that the high degree of roll limited the benefit from the wider tires. In 1977, Road and Track concluded, "our road test reports were critical of the [unmodified 1800] car's outdated feel: the suspension was too soft, the performance was not crisp, and so on... Modifications show that these problems can be overcome and the car converted into a strong performer." In racing there were indications that there was performance potential. The 544 and 122 scored many rally wins including winning the European rally championship in 1959, 1963 and 1964, and the highly-acclaimed East African Safari Rally in 1965 in a battered 544. The 444, 544 and 122 were also widely represented in contemporary sedan/saloon car racing. Art Riley won the "Little LeMans" 10-hour endurance race for sedans at Lime Rock in 1957, 1958 and 1961. Volvo won the 2 liter class of the European Touring Car Championship in 1963. The 1800 was abandoned early on by the factory as a race or rally car, and got its only chance in the U.S. where such racers as Art Riley improved its performance image with an SCCA National F Production Championship in 1966 and several highly placed finishes at Daytona and Sebring. In later years, Portland, Oregon, racers Gary Small and Lans Stout made numerous appearances in the SCCA Championship Runoffs in their 1800s. Richard Gordon of IPD started racing a 122 in 1970 and by 1973 had won two SCCA regional championships before going on to the 140. Despite weight penalties and other rules which severely handicapped his efforts, Lans continued to campaign his 1800 until he finally sold it this year to the Keller brothers of Illinois, where it will continue its racing career. Unfortunately, Volvo's lack of attention to nurturing a performance image handicapped Volvo racers and street performance enthusiasts in comparison to those of other marques. Both U.S. and European manufacturers regularly offered performance options and/or complete performance versions of their standard models. This allowed the enthusiast to buy a car with improved performance, but more importantly qualified a whole list of performance options for use in race versions. These were sometimes known as "homologation specials." Alfa regularly produced performance versions of its sedans with whole bodies made of aluminum to reduce weight along with performance versions of the standard engine and fender flares to accommodate wider tires and wheels. Lotus took the Ford Cortina, added a twin-cam head, aluminum body panels, close ratio gear box and made a performance sedan out of it. Ferrari was able to qualify cars such as the famous GTO (GTO is short for Gran Tourisimo Omologato -- translating to Grand Touring Homologated) on the basis of their alleged similarity to other models, and promises that more would be built and offered to customers during the course of the season. Volvo? Well, there were several basic problems. The range of performance parts offered was not as extensive as for other marques. Volvo did develop quite successful performance parts, particularly for their rally cars, and offered them to the public, but only through their R-Sport performance catalogue, not as performance options or performance models that could be purchased off the showroom floor. Unfortunately, there was no Volvo equivalent of the Cooper S Mini, Lotus Cortina, or Shelby Mustang. The 1965 homologation papers for the 122 illustrate the difference. The car was certified by the FIA with wheels as wide as 5.5 inches, standard or close ratio gear box, tubular header, a modified head with larger valves and an 11:1 CR, but without the wider track, reduced weight, rear disc brakes, and Weber or Solex carbs that were on homologated versions of competing cars. And did anyone even know that you could get a factory high-performance head or wider factory wheels for your 122 in 1965? The R-Sport catalogue is a wonder of performance parts, most produced by Volvo: suspension components, Solex carburetors (similar to the Weber), intake manifolds, exhaust headers, bigger valves, performance and racing head castings. Combinations of these parts promised to produce between 140 and 190 horsepower B18/B20s depending on the specific components used. Put the right combination of parts together and you could create a completely different beast. Road and Track, in a 1977 test of a modified 1800 using a combination of aftermarket and R-Sport parts, stated: "Alterations to the suspension have brought about dramatic changes in the handling. Driving the [modified] P1800 has almost nothing to do with what you would experience if you went out looking for one to buy, but it is great fun and damn exciting." The problem was that most of these parts were not offered in a manner that allowed them to be used on Volvos in various forms of production car racing. They were legal for the top classes of international rallying, but were not legal for production car racing where the rules restricted modifications to those at least theoretically offered to the public though normal dealer channels, and required that a certain number of the performance versions of any model be produced. Thus, Volvo racers were stuck with stock weights, narrow wheels and SU carbs against lightweight aluminum bodies, Weber carbs and wide wheels accommodated by fender flares. Given these handicaps, they did very well. To make matters worse, as other manufacturers produced performance models, Volvos evolved into safety cars. After 14 years of only slight modifications, Volvo's only attempt at a widely-produced sports model, the 1800, was killed off by outdated technology, high prices and competition from new higher-performance models from other manufacturers such as the Porsche 911, Datsun 240Z, etc., which offered updated styling and greater performance, often at a lower price. qualified in three of the top four spots in a class that included all non-V8, pre-1962 production sports cars. In 1991, Klaus Schonfeld's 544 won the group race at Watkins Glen for all pre-'62 sports cars and sports sedans -- one Volvo against more than a dozen Porsche 356s! That same weekend, I finished fourth in group and first in class in a group of pre-'68 sports cars that included Lotus Elans, Porsche 911s, Corvettes and Jaguars. In 1992, at the Canadian Vintage Motorsports Festival at Shannonville, Ontario, my 1800 finished first overall in a group of both small and large bore vintage sports cars, including 911s, 914s, Corvettes and XK-Es. On the West Coast, there were similar wins by Rauch and Rodenbush. Volvos made the cover of vintage racing magazines. Vintage clubs moved us up in class to the point that in '96, SVRA, the largest vintage group at the time in the eastern U.S., classified the P1800 in its B production class of pre-1972 sports cars and sedans, where it was pitted against Ferraris, Porsche 911s, Datsun 240Zs, Lotus Elans, Lotus Super Sevens, etc., and we still won (I finished first in class in every SVRA vintage race I entered that year). In 1998, two of the largest vintage events in the U.S. were the dual 50th Anniversary events at Watkins Glen. My 1800 qualified second in group at both the HSR and SVRA events. In each case, the only car with a faster time was the original national championship-winning, factory-backed, BRE (Brock Racing Enterprises) Datsun 240Z. In September, 1998, Gary Jebsen won his group with SVRA at Summit Point. In 1999, Ian Locke, in his first time out in his 122, won the vintage enduro at Mosport Motorsport Park -- you may have seen the photo of his car in Grassroots Motorsports. In the Midwest, David Hueppchen has been impressive racing an 1800, usually with a basically stock engine,* and the Keller brothers have raced numerous old Volvos with success. Back on the East Coast, Duane Matejka has dominated the Volvo Historic Series, beating cars in the larger displacement as well as 2 liter classes. Personally, every time I drive my 1800 out of the paddock to the false grid past lines of Porsches, Alfas, Jags, Corvettes, Loti and Datsuns to my position at the front of the grid, I feel a sense of Volvo pride, satisfaction and a small measure of revenge on those competing cars that allegedly killed off the 1800 a long time ago. What does all of this have to do with the average owner of old Volvos? 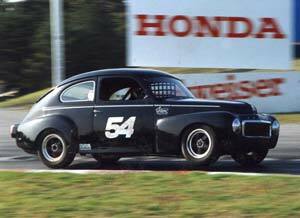 Racing success has proved that with the right modifications old Volvos can perform on a par with, or better than, those cars they supposedly did not compare with in the '60s and '70s. On the street, Volvo enthusiasts have cars which have been clocked with 0-60 times lowered from a stock 13-plus seconds to as low as 8.5 with SU carbs and street gas, or even 7.5 seconds with Webers and extensive modifications. But still there are those who say a Volvo would be a nice car -- if it only had better performance. My racing 1800, with approximately 200 HP pushing 2100 lbs., is a perfectly marvelous sports car. It has achieved over 140 MPH at Road Atlanta at 8000 RPM in 4th gear. In vintage racing it will run with the best. I've even raced it against contemporary cars with success, and have second and third place finishes in the Eastern Motor Racing Association's "Big Bore Class" against current Corvettes, Mustangs, Camaros, Mazdas, Porsches, etc., driven by drivers who were born long after 1800 production ended. It is an easy car to drive, it idles at 1300 RPM, has good torque and a fairly wide power band. With this point of reference, I have dreamed for years of putting an 1800 on the street with similar performance characteristics. (Unfortunately, there is no way to get 200 HP out of a normally-aspirated B20 on street gas -- the race car runs at least 108 octane leaded racing gas with a CR of over 13.5:1. It gets between four and five miles per gallon.) Thus, we began exploring alternative ways to achieve similar performance. In the next installment, we will discuss choosing supercharging instead of turbocharging or an engine swap, will get into the details of supercharging the B18/B20, and cover other aspects of the "ultimate vintage Volvo" project. If you have any questions, please feel free to contact me at jparker3@twcny.rr.com or (315) 478-1229. * John mentioned me racing my 1800 with basically a stock engine. Thanks, John. It is basically a stock B20E, very close to legal for SCCA ITB club rules. I decided a long time ago for my mildly modified 1800 that a thoroughly, fanatically blueprinted B20E would be the most power for the least money, and be very economical to maintain. One of our goals was to go as fast as possible on the track for the least amount of money with a car that is, or is close to, streetable. I did a 2:55.179 (82.2 MPH average speed) race lap last weekend at Road America (a four-mile course). 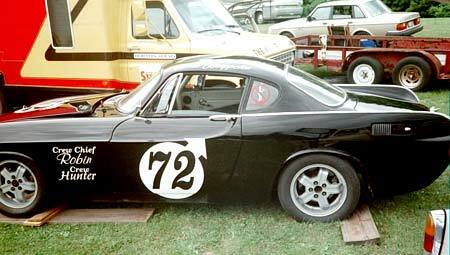 Only six of the 27 racecars at the last Vintage Volvo Gran Prix were faster. Not bad for a car with roll-up glass windows and a heater. There is a license plate in this car's future. With cockpit adjustable fuel pressure, it may be fairly good on gas on the street.